‘Blue Horizon’ is a custom built, PC60 power catamaran. She is a luxurious blue water cruising yacht, specifically designed, engineered and built to meet the demands of the most discerning yacht owner. Her sleek, modern clean lines ensure timeless beauty and will turn heads at every dock she visits. The PC60 offers stately luxury and amenities of a much larger motor yacht. The lavish on deck master stateroom, with full walk around King bed, gourmet galley and spacious salon ensures the ultimate in comfort for your crewed charter. The salon, bar and gourmet galley integrate seamlessly and form a large and comfortable area for entertaining. The large salon offers very comfortable seating and unobstructed views through the large side windows and aft salon sliding door. The internal stairs to the flybridge from the salon is a wonderful feature, and provides easy access while cruising. The flybridge offers considerable area to entertain and relax on your Caribbean vacation. The seating offers dining for 6 in comfort and the bar is particularly well designed with bar stools, built in BBQ, basin, fridge, and ice maker. Enjoy a luxurious vacation aboard this power catamaran! He has worked at numerous private events as a cocktail waiter which makes him competent in guest handling. Tailored to fit your special needs and wishes, his services will make you discover the freedom only a boat can offer. Whether you are looking to enjoy a laid-back day on the beach, jump into an active holiday, indulge in the local fine wine and dining, discover the culture, appreciate the nature or just do nothing at all - he will help make it happen! Alex is fluent in German. Euslyn has been working in the yachting industry as a chef for the past 10+ years, primarily on private yachts up to 120'. In recent years, she has moved from private yachts into charter as she loves the ability to meet many different people from various cultures and parts of the world. Euslyn loves creating unique menus for her clients using fresh ingredients and featuring recipes with a Caribbean flair. Dinner is her favorite meal of the day and she can't wait to share her her fantastic creations with you aboard Blue Horizon. Contact us for rates and current availability or to book a charter aboard Blue Horizon! 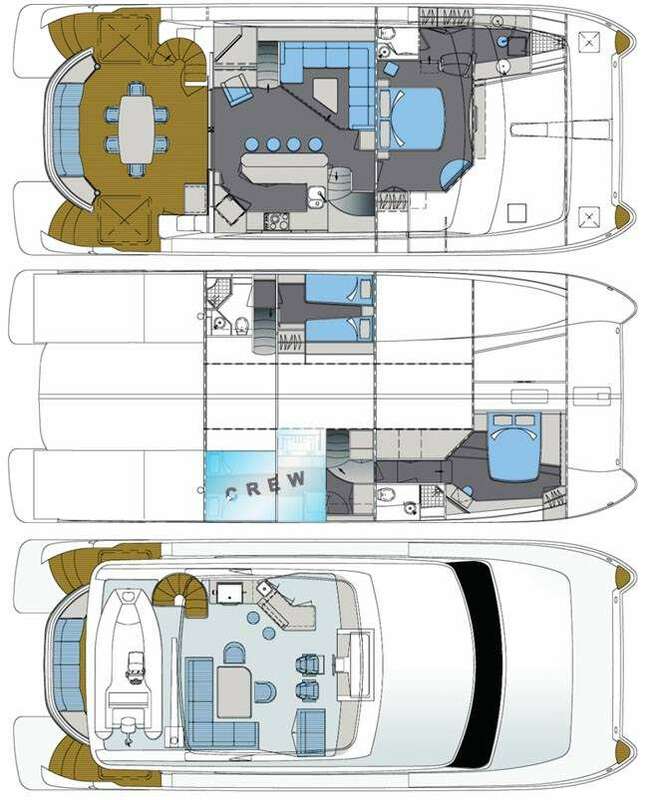 Blue Horizon can accommodate 6 guests in 3 cabins. The Master cabin has a king size bed, shower and toilet. A VIP cabin has a queen size bed, shower and toilet. A Guest cabin has two twin beds that can convert to a king, shower and toilet. Blue Horizon is fully air conditioned through out, with individual room controls. Menus are custom tailored to your individual desires... Bon Appetit! Light or Hearty…. The choices is yours! Assorted Croissants, Muffins, Granola & Yogurt, Fresh Fruit and Juices accompany coffee time each day!